Eden Hazard superb run of form has seen him compared with the world’s best, but the Chelsea forward is focusing exclusively on helping the Blue’s succeed. 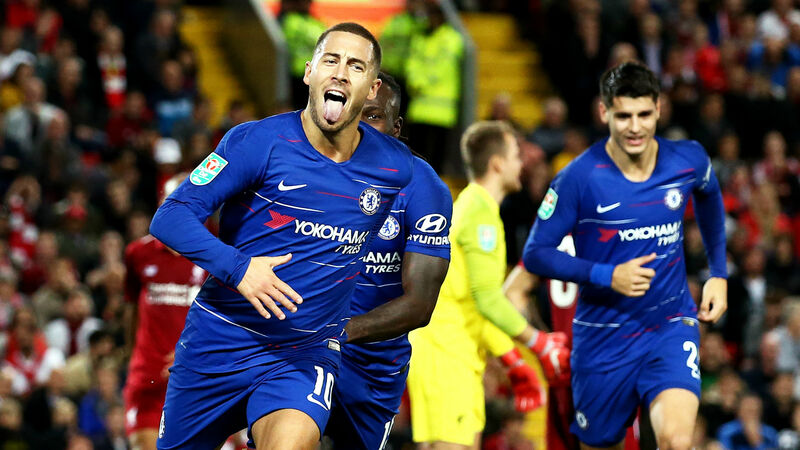 The Belgian is pleased to be compared with Cristiano Ronaldo and Lionel Messi, yet Hazard isn’t setting any particular objectives for himself following his splendid run of form this season. The 26-year old has netted five goals in six matches to start the Premier League season after scoring 12 goals in the 2017/18 season. He also scored a scintillating goal which could be a contender for goal of the year in Wednesday’s Carabao Cup clash with Liverpool, as he dashed through the Reds defence for a late winner. Chelsea boss Maurizio Sarri as of late expressed that, on current form, Hazard could scored 40 goals this season, while Ross Barkley said his colleague is in good form than Lionel Messi and Ronaldo as of now. The Belgian himself, however, isn’t as concerned about Messi and Ronaldo comparison. “I don’t have (goal) targets to be fair – my only target is to win something every year. I want to win trophies,” he said. “It is not important how many goals I score. You know me, I don’t care about that. I just want to enjoy my football and win games. “At the moment I am scoring goals, that is why everyone is talking for me to be in the top three (players). It is a pleasure to be there. I just want to keep going. I am the same player as two years ago, three years ago. I’m now in a period that I score a lot of goals, and hopefully I keep on scoring. However, Hazard is yet to pen a new deal with the Blues, says he is enjoying the moment right now and riding a rush of momentum dating back to last season. “That is why I like football. At the moment, we are winning games so it is more easy to smile but when I am on the pitch I just try to be happy. At the moment it is good. I am scoring goals, we are playing good, so I am enjoying it but we will see in the future.